The site of a fire which destroyed more than 100 works of art was burgled before the blaze began, say police. The fire spread through factory units at the Cromwell industrial estate in Leyton, destroying a warehouse owned by art storage company Momart. Work by artists Tracey Emin and Damien Hirst, many owned by collector Charles Saatchi, were among those destroyed. Police said arson was a possible cause but it was too early to know if the fire had been started deliberately. 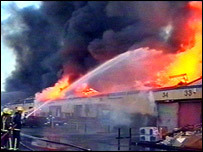 The fire, which is thought to have destroyed more than £50m of art, broke out at the storage facility on 24 May. A Scotland Yard spokeswoman said: "It is now believed that the fire began in a particular unit. The warehouse had 34 units in total - two main ones and 32 smaller ones. "One of the smaller units where the fire actually began appears to have suffered a burglary, but it is yet to be established if the fire was deliberately started." Momart's managing director Eugene Boyle said the company was still not able to access the site due to ongoing police investigations. "Whilst they (the police) have not concluded their investigations, indications are that it started following a break-in to premises containing watches, computers and mobile phones. "It was at the opposite end of the complex of business units from the Momart warehouse," he said. More than 100 artworks from Charles Saatchi's famous collection were destroyed in the fire. Author Shirley Conran and artist Gillian Ayres had £2m of art at the Momart facility in Leyton, east London. Damien Hirst's 22ft (6.7m) Charity, based on the old Spastic Society collection boxes, was one of the artworks thought destroyed later found to have been saved. The owners of some of the artworks destroyed in the fire are considering legal action against Momart. But a Momart spokesperson insisted the company had not been negligent.